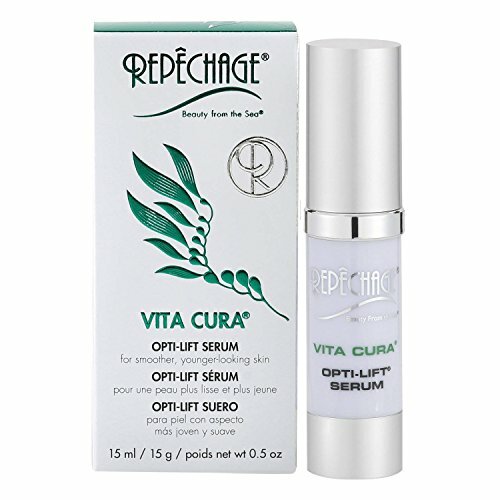 Repechage Vita Cura Opti Lift Serum Instant Virtual Eye Contour Lifting Effect to Smooth Out Look of Crows Feet Wrinkles with Peptides 0.5 fl. Oz. This lightweight eye contour serum is an award winning anti-aging beauty-must have and editor favorite. Based on patented technology and advanced skincare knowledge, Repêchage Vita Cura Opti-Lift Serum utilizes a three-dimensional biopolymer from Pure Almond Protein that helps diminish the appearance of crow's feet and other signs of premature aging. In addition to providing skin an instant virtual lift that lasts about 6 hours, it also contains the highest quality ingredients that help skin look smoother and younger long-term. Powerful skin firming peptides combined with Marine Seaweed work to help revitalize skin for a youthful look that glows and a radiance that lasts. May be used around eye contour area as well as other areas of concern including nasal labial lines, forehead and in between the brows for younger looking skin. Developed by world renown licensed esthetician, Lydia Sarfati as featured in Vogue Magazine. Her professional products are used at the best spas and salons globally. Made in the USA at our Family Owned and Operated manufacturing facility. We do NOT use contact manufacturers. Our formulas are all exclusive to Repechage. You will not find anything like it on the market. Safe and effective. We never use parabens, synthetic fragrances nor harmful chemicals. We do not test on animals. If you have any questions about this product by Repechage, contact us by completing and submitting the form below. If you are looking for a specif part number, please include it with your message.